You probably use your Ninja coffee bar every day, sometimes maybe even multiple times a day. Think for one second about how much bacteria and germs that exposes your coffee bar too! Even if you are very careful to use filtered water and make sure your hands are clean every time you make coffee, there's no doubt that germs, calcium deposits, and other gross things are building up in your Ninja coffee maker. Cleaning your Ninja will keep it running smoothly, but it will also keep the flavor of your coffee at its best. Here are all the details on cleaning your Ninja Coffee Bar that we didn't cover in our Ninja Coffee Bar troubleshooting guide. Your coffee bar already has most of the pieces you need when cleaning it. This includes hot water, which is going to do most of the cleaning for you. See our full Ninja Coffee Bar review for more details on what's in the box. You also absolutely have to have a cleaning solution of some kind. 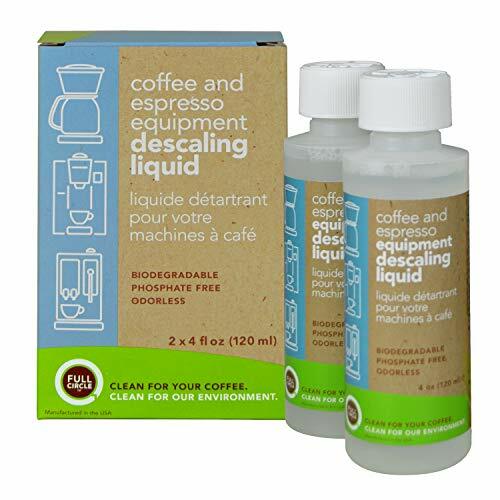 You can use any brand of descaling solution, as long as it's made for coffee makers. The other type of cleaning solution that you can use is plain white vinegar. You are also going to need hot soapy water. Not only are you going to clean the tubing in the system, but you'll want to give your water reservoir and your coffee carafe a nice washing, too. It’s recommended that you clean your coffee bar every couple of months, but it’s definitely time to clean when the Ninja Coffee Bar clean light comes on. This means that the machine senses calcium build-up. You can still make coffee with the clean light on, but it might not work consistently. The first thing you want to do when you need to clean is getting your solution ready. If you are using descaling solution, follow your brand’s specific instructions. If you are using white vinegar, fill the reservoir with about 2 cups of vinegar (to the 16 oz travel mug mark) and the rest of the way with water. Next, make sure your carafe is in place in the coffee bar so that the cleaning solution has somewhere to go once it cycles through. To work best, you’ll want to run it at the “FULL” carafe setting. The next step is to run the Ninja Coffee Bar clean cycle. This is designed to run the descaling solution through all the tubing in the machine to break up calcium deposits. Depending on which machine you have, this will either take 8 minutes or 60 minutes. Just let the machine do its thing. Don’t push any buttons or clean any other parts until the cleaning cycle is over. This next step will depend on the model of Coffee Bar that you own. If your machine has the ability to do a flush cycle, then you will want to run this cycle within 15 minutes of the clean cycle completing (or else you’ll have to start all over). To do this, wash your carafe and reservoir and fill the reservoir with clean water. When you see “FLUSH” display on your machine, press the “CLEAN” button and the 8-minute flush cycle will run. If your machine doesn’t have a flush cycle, you’ll simply want to fill your water reservoir with clean water and run an empty cycle (water but no coffee) at least 2 times to flush any remaining cleaner out of the tubing. Once the cleaning cycle has finished, you can clean up the rest of your machine. Take the carafe and the water reservoir and clean them one last time in hot soapy water. Don’t forget to remove and wash the Ninja Coffee Bar filter too! The descaling solution that works best for cleaning the Ninja Coffee Bar is Full Circle Coffee and Espresso Equipment Descaling Liquid. This stuff is made out of citric acid, which is why it works more effectively- the acid dissolves the basic lime and calcium mineral build-ups. It doesn’t have any phosphates, and the substance is non-toxic and biodegradable. Why get this over vinegar? Unlike vinegar, this stuff doesn’t leave a terrible odor. It’s also a lot easier to rinse through the machine, so you don’t have to run as many flush cycles to eliminate a strange aftertaste or smell in your coffee. You just have to mix the bottle of descaling liquid with 32 ounces of water. Add it to the reservoir. And while this liquid isn’t technically required, it does make the machine work better and will actually get the “CLEAN” light to go away, which vinegar sometimes fails to do. Cleaning your Ninja Coffee Bar is not difficult. You don’t need much- just some time and some vinegar or descaling liquid. You’ll notice a big difference once you clean your machine. Your coffee will have better flavor, your machine will last longer, and you’ll get rid of that annoying clean light once it pops up! Vinegar works well for touch up cleanings, but you’ll really want that descaling liquid for a big clean out every 3 months or so. You can give your machine a deep cleaning by holding the clean button until CLN appears (about 5 secs). This will give it a four hour cleaning.